Earlier this summer I was looking to shake it up a bit and got this crazy idea to "plein air paint" with Legos instead of paint. In short, I had no idea how difficult of a task this would was. I went up into our attic, dug out my giant childhood box of Legos, and started digging out all the 1x1 flat tiles. I quickly realized that I was working with a very limited palette. The majority of my tiles were Black, White, Red, Blue, Yellow and Medium Grey. I had some other colors mixed in but not enough quantities to do much with. This led me to ebay, I disovered I could buy the colors I didn't have in bulk. After this failed attempt I knew it would not be very efficient to keep experimenting with the actual physical lego blocks, it was just too time consuming so I turned to photoshop. 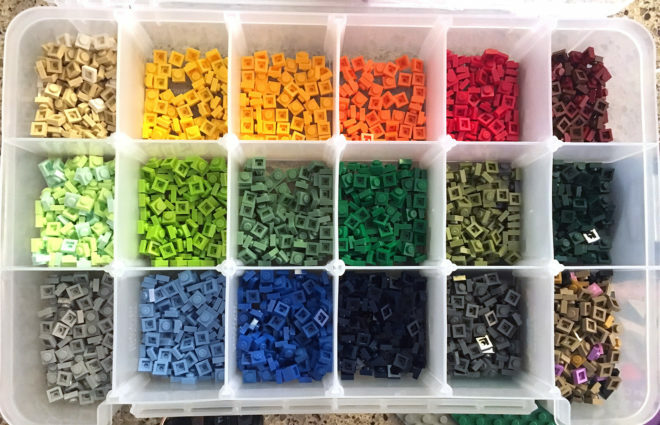 I scanned in the 25 lego colors and made a custom Indexed Color Profile where I could simplify any image into the 25 Lego Colors. This generally generated ok results but over time I noticed the Photoshop Color Indexing Algorithm would prioritize color accuracy over value accuracy. Almost any fine art painter would tell you that value (the lightness or darkness of a particular color) is ten times more important than color itself. So I took those 25 colors, gray-scaled them and then created a second Photoshop Color Index Profile with just the black and white values of the Legos. My first grayscale test below was interesting. I learned a lot through these tests and one of the biggest lessons was even though a value of a color is spot on, if its high chroma, it can quickly overpower an entire image. 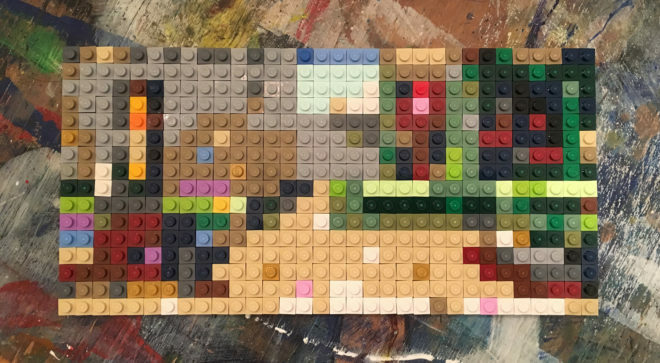 So the largest standard lego plate is 15x15" which breaks down into 48x48 pixels. As I kept experimenting in photoshop with both photos and my paintings, I did not have too much luck simplifying these images. The limited 48x48 size along with the natural tones of my paintings were not combining well. I did find if I could increase the size of the lego plate to 96x96 the results were exponentially better. See below, the middle image was 96x96 vs the left at 48x48. The right side is keyed for value accuracy. After all of this effort, I thought my earlier work would lend itself better towards the bright Lego palette. I settled on one of my favorite paintings ever, Wheat Field with Rising Sun. I built it in photoshop first, using a combination both the Lego Color Indexed File and the Lego Grayscale Indexed File to come up with what I thought was the strongest image possible. I then used this as my roadmap for building the final image. Even with this map, it still took me about 5 hours to place all 2,304 tiles on the final Lego piece. I was super excited with this final piece but I had no idea how much time I would invest pulling it off. I wanted to make some smaller versions of my paintings but getting down to the 8x12 pixel sizes, my pieces were so abstracted they looked like nothing. 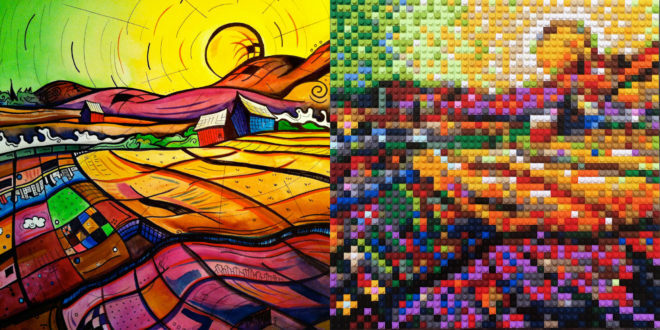 I randomly decided to put a few famous paintings through my Lego Color Index Profiles and the results were awesome!! 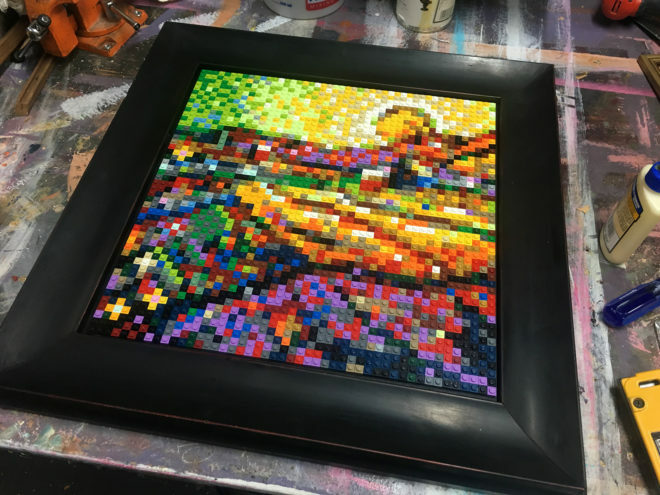 I decided to make a series of mini masterpieces and even built custom frames for each piece to mimic the frame that masterpiece is in in the museum.